Rip out invasive plants while the soil is damp, before they spread even further. Check out spring flowering trees and shrubs while they are in bloom and make notes for future purchases. Ready your compost bin, turn it and add nitrogen or plant matter if need be. Keep a watch out for asparagus beetles, aphids, cabbage worms, cutworms, scale, slugs & snails and any signs of fungal diseases. Clean the flower pots with a solution of bleach and water to kill any lingering disease or mold if used from one season to the next. If you have Togetherfarm Blocks, you can simply toss them in the dishwasher for one cycle! Seed cool season vegetables and root crops after mid-month (beets, beans, cabbage, carrots,chard, lettuce, onions, potatoes, radishes, turnips). Start warm season melons and squash indoors, to transplant after Memorial Day. Keep seeding lettuces, greens and beans. Summer bulbs can be planted outdoors. For those of you new to gardening this year, you can get a head start on the Spring weather by snapping your Togetherfarm garden beds together, add a good compost rich soil, and plant your zone appropriate veggies and flowers. And here is a zone-specific garden “to do” list from the USDA, and a task specific to do list for each zone at Organic Gardening. 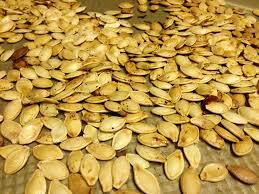 Here are some great tips on harvesting pumpkins and saving the seeds for next year. Here in the Northern part of the country Fall is in the air. It is a great time of year with warm days and cool nights. Being Fall it also means a whole new batch of goodies from the garden will be ready soon. 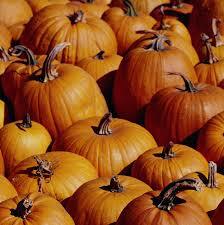 One of the most popular crops is Pumpkins. They are easy to grow and come in all sorts of colors and sizes. 1. Leave the pumpkin on the vine until it is the color you want. After you pick it the color stays the same. 2. A couple of ways to tell if the pumpkin is ripe other than color preference are first to see if the skin of the pumpkin can be pierced by your fingernail. Another trick is to check the stem. If it is withering and cracking the pumpkin is “done”. 3. You could also be a very laid back gardener and just let Mother Nature do her thing and let the pumpkins and vines be. The vines will eventually dry out and you won’t even have to cut the pumpkin off the vine to harvest it. 4. 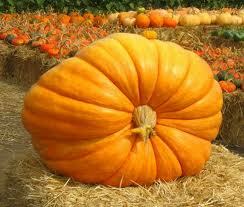 Pumpkins can get really big. Be careful to support your prize pumpkin with both hands. 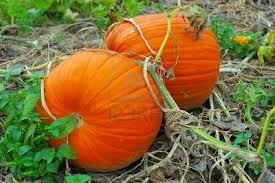 Holding your pumpkin by the stem could lead to a disaster if the stem breaks. 5. 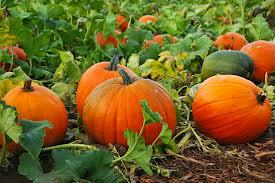 Store your pumpkins in a cool dry place (no frost) and don’t let them touch as the skins of pumpkins touching can lead to rotting. The pumpkins should last for a few months if properly stored. 1. Collect the seeds and wash the pulp off of them. 2. Allow them to dry thoroughly. Place them on a rack or screen where air can get at them for drying. 3. Once dried the seeds can be stored where there is air but no sunlight. Recycle an old envelop for this and you can mark what the seeds are right on it. 4. The seeds should last a few years if stored properly. Where does food come from before it gets to the grocery store? The USDA has strict country of origin labeling (COOL) laws that, “requires retailers … notify their customers with information regarding the source of certain foods.” Effective as of 2005, the law covers just about anything edible including: muscle cut and ground meats (beef, veal, pork, lamb, goat, and chicken); wild and farm-raised fish and shellfish; fresh and frozen fruits and vegetables; peanuts, pecans, and macadamia nuts; and ginseng. Yes, ginseng made the list and is specifically called out. Although the law covers country of origin, it’s difficult – if not impossible – to tell where within the country the food came from, the conditions in which it was raised, or the handling of that food from origin to table. This is just one of many factors that have fueled local food movements. The microclimate in your area can affect what grows best in your yard. If you are interested in learning more, FoodRoutes.org is a great place to start. They point out that in addition to exceptional taste and freshness, buying locally strengthens your local economy, supports endangered family farms, safeguard your family’s health, and protects the environment. And don’t forget the experience factor. Whether you are checking out local farms or growing your own food, you’ll have these memories for a lifetime. If you want to know where your produce comes from, one of the best ways is to grow it yourself. Check out our Kickstarter Campaign, where we are raising funds to bring our very first product, TogetherFarm Blocks™, to you. If you have a small space you can use these blocks to quickly build a custom garden box without tools or carpentry experience. Check them out!